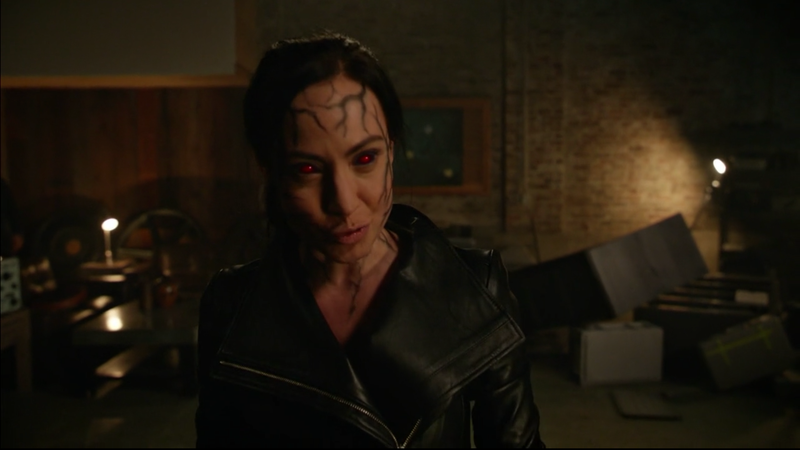 Nora Darhk (Courtney Ford) isn’t just hinting at Mallus’ arrival, but the future of Legends. In an interview with TV Line, Klemmer hinted at what fans can expect for the next season of Legends of Tomorrow after tonight’s big finale. The series, which was recently renewed for a fourth season, has spent the past few years mixing real history with mythical characters and scenarios. These include Mallus, the Spear of Destiny, and Vandal Savage... who we don’t talk about, guys. We just don’t. [Mallus] is a sort of bellwether of bad guys to come in season four. Up until this point, we’ve been dealing with earthly and historical bad guys, and we certainly had fun with all of that, but this year we dabbled in the world of the occult, through Damien Darhk and his enterprises. But you know that Constantine is coming onto the show next season, so we want to go deeper, we want Mallus to be used as “the tip of the iceberg.” He is not human, and we want to start playing with the idea that Earth hasn’t always belonged just to our kind. We want to get into the world of fantastic myths and monsters a bit more. Legends of Tomorrow returns tonight with its big wild west showdown. The Legends have their totems, Mallus has been freed from his prison, and Jax (Franz Drameh) is returning for a cameo. Klemmer did say at least one of the Legends will be leaving the Waverider by the end of the season, which means this is their swan song. My money and hopes are on Amaya Jiwe, mostly because she’s become the absolute worst this season and I think it’s about time for her to go. Nate better stick around, though. I need my hair bro. Look Who&apos;s a Totem Bearer Now, Suckas!